My friend Sherri, from the wonderful blog Literary Sherri, posted a few months back about whether cursive was becoming a lost art. You can read her thoughts on the topic here. After coming across the post recently through Pinterest, I decided to go back and re-read the post I wrote five (insert creaking bones here) years ago about cursive instruction in my classroom. First off, as you can tell from the title of this post, I don't use cursive. I have no problem with people who do. Quite honestly, mine is just not that pretty and some time during middle school I gave the whole thing up. I can use it as a motivator. There is something about cursive that makes kids excited. Don't ask me what it is…I am pretty sure I am too old to know. However, I do remember having that same excitement back when I was a third grader. I use this to get them motivated to transition quickly. The more time we have at the end of the day, the more time we can spend on learning new letters in cursive! Research supports that it helps students with dyslexia and dysgraphia. There is something about the smooth flow of the letters and the connection that helps these students improve their letter reversals. Since I typically end up with at least 3-4 students who are either identified as dyslexic or moving in that direction, it serves a dual purpose to begin teaching cursive early. I can sneak in other academic skill practice. Want to get kids excited about practicing spelling words? Let them use cursive! Want to get them to write paragraphs? Use it as a cursive test. I had my kids eagerly writing 2-4 quick writes a week because I was checking them as part of how they can earn their cursive license (which I'll tell you more about next). Of course, they also had to have the parts of a paragraph and color code them in order to get credit. BOOM! Kids excited to write. It is still a required standard in 3rd grade…so I teach it to my advantage. The students in my third grade classroom are expected to learn and master cursive during the year. To help facilitate excitement (and to ensure that I am able to read assignments), I have a cursive license. It is super cute and has the student's picture and signature. I usually allow students to earn their license by writing paragraphs for me, which serves the dual purpose of getting them practicing quality paragraphs and practicing their best cursive. Once they've earned the license they are allowed to write cursive on any documents. However, if they are not neat or speed through their cursive, they can lose their license. 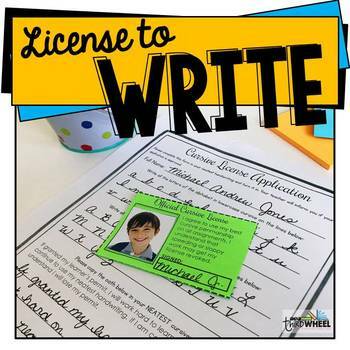 Here's a link to download my cursive license for free, just in case you want to try it out in your classroom. What do you think? Should we still be spending time teaching cursive? Leave me a comment and let me know what you think! What a super idea! 🙂 I am going to use this next year! Thank you for sharing! Question, what cursive book do they complete? We use Handwriting Without Tears…although I don't prefer it. I really like Zaner-Bloser handwriting. Our district has pulled handwriting from our curriculum. In fact, some nighttime new show came to our district last year to film the "dying" handwriting. It hasn't premiered on tv yet though. Thanks so much for sharing. I'm new to 3rd grade this year and will be using these in my classroom. I love this idea! I teach 1st and 2nd grade, and can easily use this with my 2nd graders. Thank you for sharing! I have two students with dyslexia and will certainly encourage them to use cursive writing. I am most interested to see how this works. Thanks so much for your comment. I highly recommend giving it a try. It can really help with those letter reversals.